This is for ONE Dinosaur Egg Bath Bomb which has 2 plastic dinosaur toys inside, for fun in the tub! The color/style of the dinosaurs may differ from the pictures. 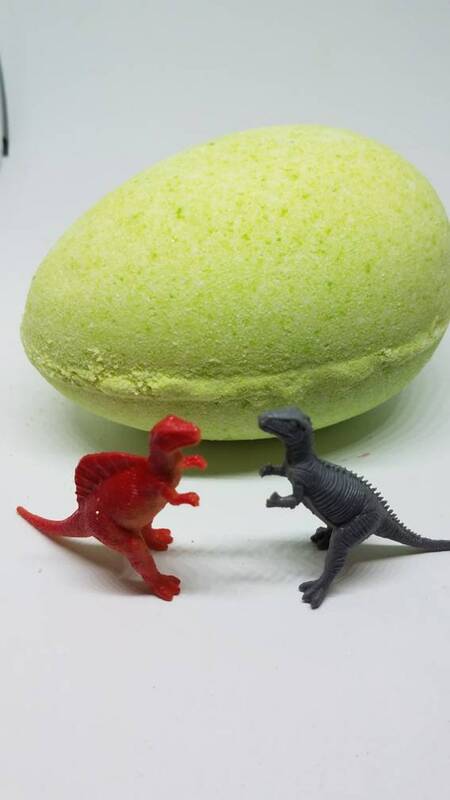 As the bath bomb fizzes and foams the dinosaur egg "hatches"! The bomb weighs over 9 ounces. The color may vary some due to the production of small batches. The fragrance is Green Apple, a very crisp, clean scent. You will definately relax in the conditioned water and your skin will feel super soft and refreshed.